The Chinese military will staunchly protect the country's maritime rights and interests and is "fully confident and capable of addressing various security threats and provocations", a senior military leader said on Sunday. State Councilor and Minister of National Defense Chang Wanquan did not directly refer to the South China Sea situation, but tension there was heightened this year by increased US patrols and the arbitration case brought by the Philippines against China. 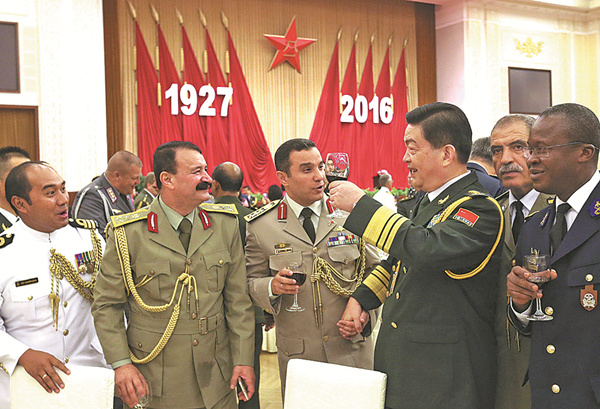 Addressing a reception in Beijing marking the 89th anniversary of the People's Liberation Army, Chang said the PLA will "unswervingly safeguard national sovereignty, security and development interests including territorial integrity and maritime rights and interests". "It will always stand ready to be called upon and be able to fight and win," he said. In July, the PLA conducted two military drills in the South China Sea. Zhang Junshe, a senior researcher at the PLA Naval Military Studies Research Institute, said the increased US military patrols and joint drills with allies "have imposed military intimidation (on China) and fueled regional tension". However, China's recent drills in the South China Sea are "of a totally different nature," as the PLA drills in Chinese territory, while the US, an outsider to the region, covers thousands of miles to come to China's doorstep, Zhang said. Chen Qinghong, a researcher of Southeast Asian and Philippine studies at the China Institutes of Contemporary International Relations, said some senior US defense officials had made hard-line comments about the region recently, and Washington "will possibly continue its tough gestures". Reaffirming China's defense policy, Chang said the PLA will provide additional public security through enhanced participation in United Nations peacekeeping, counterterrorism, humanitarian assistance and disaster relief missions. Chang also touched on the cross-Straits situation by reiterating that "both the mainland and Taiwan are part of the one and same China". He said "adherence to the 1992 Consensus and opposition to ‘Taiwan secession' is the political foundation for cross-Straits relations to develop peacefully". Taiwan's new leader, Tsai Ing-wen, has not directly reaffirmed commitment to the 1992 Consensus, which states that both sides of the Taiwan Strait belong to one China. "Secessionist attempts in any form by anyone at any time will never be accepted by the PLA, the 1.3 billion Chinese people or the Chinese nation as a whole," Chang added.